Have you ever seen the bags of dried chiles in the grocery, the ones in the Mexican foods aisle, and wondered what to do with them? There are so many different varieties to choose from, and each has its own flavor profile and heat level which can make experimenting fun and/or painful. We keep several bags on hand for different cooking projects, including guajillo chiles, which are dried mirasol chiles. Harissa sauce is a traditional condiment from North Africa, and there are many different recipes for it depending on where you go and whom you ask. 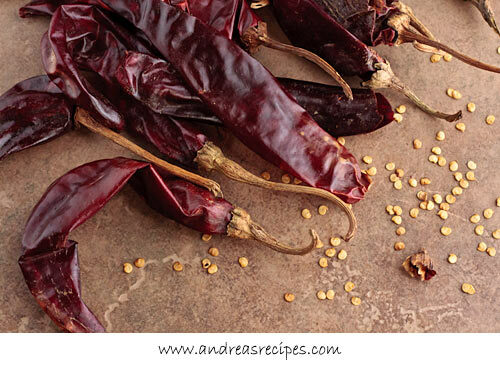 The basic recipes is dried chiles + cumin seeds + coriander seeds + caraway seeds + garlic + salt + olive oil. Types of chiles and amounts of any of the ingredients is up to your imagination and how much heat you can stand. I like to mix up ancho and guajjillo chiles in my harissa. 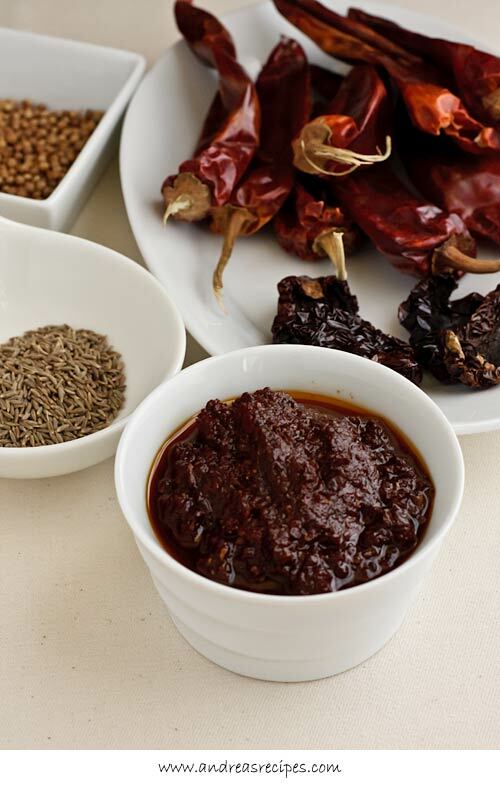 The mild guajillo chiles give sauces a glorious red color and a bit of mild heat, which combines nicely with the slightly hot and sweet ancho. I’m not a fan of caraway, so we skip it. Harissa pairs very well with lamb, chicken, beef, fish, couscous, chickpeas, and root vegetables, so let your imagination run wild. And prepare your taste buds for an amazing treat. 1. Remove the stems and seeds from the chilies. Soak them in boiling water for about 20 minutes, until they are plump and soft. Drain well. 2. While the chilies soak, toast the cumin and coriander seeds in the skillet over medium heat until they are fragrant. Allow to cool, then grind to a fine powder. 3. Add the drained chilies, cumin, coriander, garlic, salt, and olive oil to the work bowl of the food processor, and pulse until the mixture is a smooth paste. Transfer to a clean jar with lid and top off with a little more olive oil. Will keep in the refrigerator for up to 3 weeks. Harissa is a staple in my pantry, yet I almost never make it from scratch. Now that I know it’s so easy, I’m going to blend up a batch to keep around. Can you freeze it? This is something I’ve never tried making and always wanted to! My daughter fell in love with these dried chilis but I don’t think she makes her own Harissa. I’m definitely going to try it. Thanks for sharing. I’ve never tried making it from scratch. Thanks for the idea, Andrea! Yes Lydia, you can freeze it. It will keep for a couple months. Kalyn, SharleneT, and Nicole, you should try it! I made this, and it turned out beautifully. I only had the Guajillos, and added the juice of half a lemon.